a lot of water went under the bridge since..
"This is an important piece of info." why is this so important? 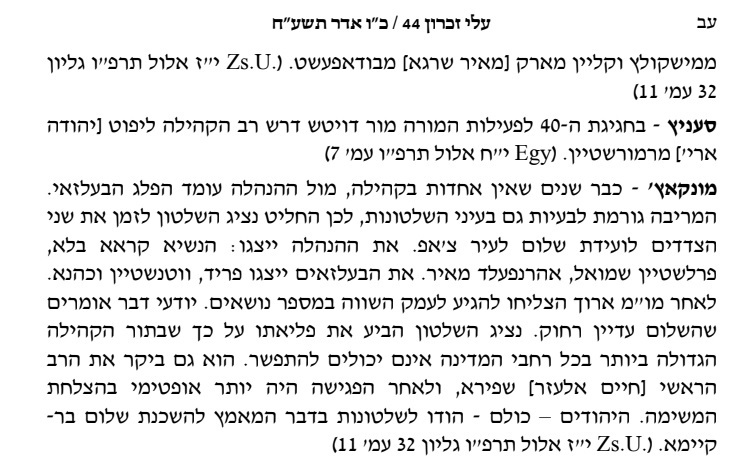 How about how about the klush war, city records (available on line) shows that Rav halberstam was behind the arrest of Rav Klazner, any importance to that? very heimish in Lubavitch, first "they" had incarcerated the Bal H'tanya than the 'yevsakyeis' "they" also went to the Government..
No I can't. I have once read something like an indictment or Judgment official protocol from the city police or whatever and its very un flattering, however I regret mentioning it. sorry. H: "it's from the Zsidó Újság = Jewish Newspaper"
tzig: "(could be a Belzer drelnak is behind the report?)" NYC Mayor Koch wrote a letter from 'city hall' to UTA rabbi leibush lefkowits, in essence; that the Belzer drelyak is coming to NY and he should curb his yeshiva "boys" not to disturb the peace in the city while the 'rebbe' is here visiting. 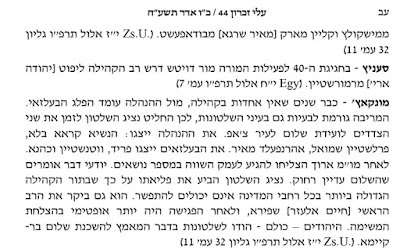 did the Belzers rat again on chasidim? who knows. ps: Koch was biased, his father was a real BelzerFinAmool, and Koch considered "himself" a Belzer too. look again till you find it. "Government Intervention for Chassidic squabbles" !? "nothing preserves a dynasty as well as sycophants as followers. keeping them ignorant and dependent on the community and its rebbelach is a time honored way of keeping control. iz git to zahn a rebbe. the chareidi communities who foster such behavior in the US and Israel are a massive chillul haShem; but nothing to see here. ask shafran and gordimer, only the OO are a threat to orthodoxy. chillul hashem in defense of orthodoxy has become a mitzvah." what did he knew when he was crying on the matzav.. and when did he knew about the well planned and executed 'political stunt' Felder will deliver with sucess..
in fact he warned of the danger coming publicly on many occasions.